It is an all-too-common probable cause statement found in literally hundreds of National Transportation Safety Board (NTSB) accident reports. In many of these cases, the pilot simply asked more of the aircraft than it could aerodynamically provide. These scenarios are also indicative of the types of inflight loss of control (LOC) accidents that have plagued the GA community for decades and have remained the elusive white whale of the aviation safety industry. But LOC accidents — your days are numbered! Thanks to advances in technology and a renewed focus by government, industry, and academia on ways to help eradicate LOC, the industry is on a flight path to success. Solving the LOC equation is by no means an easy task, nor is it prudent to believe in any type of silver-bullet solution. There are many variables and underlying factors leading up to a LOC situation (distraction, weather, fatigue, lack of proficiency, etc. ), but in most cases it boils down to one simple element — proper energy management. The key is figuring out the most effective way to help pilots better recognize their aircraft’s energy state and alert them when life-saving intervention is needed. Short of having something reach out and grab a pilot by the collar, angle of attack (AOA) indicators fit the bill nicely in terms of augmenting airspeed information and providing energy state awareness in critical situations. Many pilots may already be familiar with the benefits of an AOA system, yet very few GA pilots have equipped with this technology. High prices and installation red tape have historically contributed to that. But, as you may recall from previous AOA-related articles in this magazine, the FAA has recently made this technology more wallet-friendly and easier to install. Even more exciting is how future applications of AOA-based systems will not only help pilots manage a critical phase of flight, but they may also hold the key for automation safety with aircraft of the future. Join me for a brief look at the past, present, and future of this impactful technology. There has been a renewed interest in the benefits of AOA indicators in recent years, but this technology is hardly new. In fact, AOA technology first debuted on the Wright Flyer, albeit in a more crudely fashioned setup than by today’s standards (picture a stick with a flailing piece of colored yarn attached). The Wrights were well aware of this aerodynamic “secret” that could abruptly cause an airfoil to cease its lift-giving powers. In later years, military aviators were also keen on leveraging AOA technology, which even today proves especially useful in helping U.S. Navy pilots meet the challenging demands of aircraft carrier landings. But before I go further, allow me to break down what angle of attack is and why it’s important. Simply put, the angle of attack is the angle between an aircraft’s wing and the oncoming air (the FAA defines AOA as the acute angle between the chord line of the airfoil and the direction of the relative wind). If this angle becomes too great in flight (critical AOA), lift is drastically reduced and the airfoil will stall. Depending on how the aircraft responds, a spin may also develop. Not good. Most GA pilots rely on airspeed and the piercing bleat of the stall warning horn to avoid getting into a stall situation. However, this bipartite solution has its limitations. 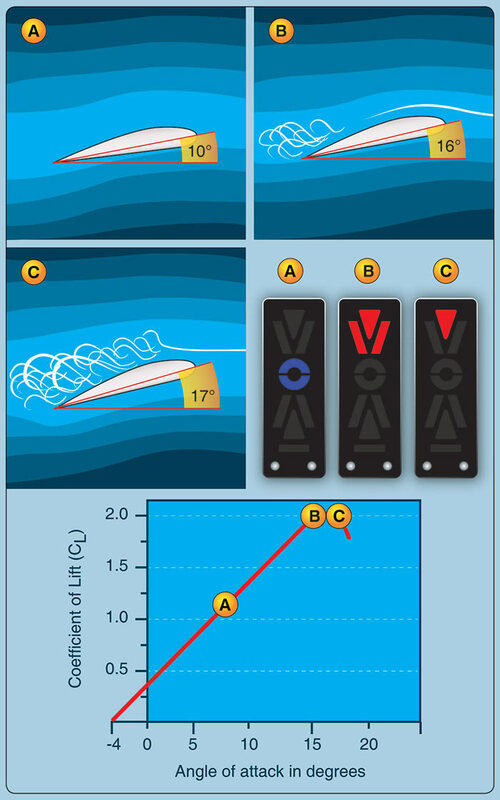 A published stall speed, while generally accurate, assumes that a specific set of circumstances are in play during flight (i.e., unaccelerated and coordinated flight and, typically, maximum gross weight). Furthermore, speed by itself is not a reliable parameter to avoid a stall. As you have probably heard a million times by now, an aircraft can stall at any airspeed and any pitch attitude. As far as the stall warning horn system goes, this is more or less a binary system — it is either on or off, with little warning to provide a corrective input. Having a reliable method of “seeing” this all-important angle of attack is definitely where it’s at in terms of mitigating LOC-related accidents — the leading category for GA accidents. To get a better grasp on the situation, the General Aviation Joint Steering Committee (GAJSC) — a joint government/industry partnership — took a deep dive into GA accident causal factors in 2011 in order to seek effective mitigation strategies and safety initiatives. The GAJSC convened two LOC Working Groups that reviewed 180 accidents that occurred over a 10-year span. AOA awareness, not surprisingly, was at the top of the GAJSC’s list in terms of focus areas. What the GAJSC’s LOC Working Group discovered was that a pilot’s awareness of overall energy state in flight was just not where it needed to be. AOA indicators seemed a logical place to start with how to mitigate this risk. At the time, there was a path to having AOA indicators installed, but these were qualified as primary flight instruments requiring a more costly and labor intensive process, hardly within the means of an average GA pilot. What was lacking was a means of having this equipment installed as a supplementary system that would require a lighter touch regulation-wise, but still be permissible in type-certificated aircraft. A conceptual representation of an AOA indicator. It is important to become familiar with the equipment installed in a specific airplane. It turns out that several avionics manufacturers interested in developing AOA equipment for the light type-certificated fleet had approached the FAA’s Small Airplane Directorate. Both the FAA and industry embraced this idea and the framework for change was quickly underway. By February 2014, the FAA issued a ground-breaking policy statement that laid out not only the required standards, but also provided the limitations of non-required safety equipment for type certificated aircraft, how it can be used, and what manufacturers had to do to produce the equipment. In addition to AOA technology making a new foray into pilot safety, it also became the nexus for how to get other non-required safety equipment into the light end of the GA fleet. (By the way, if you are not familiar with the FAA’s Non-Required Safety Enhancing Equipment (NORSEE) policy, take a minute to have a look (go.usa.gov/xnJ9d)). Among those working behind the scenes to drive support of this policy, and further the agency’s understanding of AOA technology, were the top-notch student and faculty researchers at the FAA’s Centers of Excellence (COE) for GA safety research. The Center for General Aviation Research (CGAR) did initial work in this area, led by Embry Riddle Aeronautical University. Then in 2012, the FAA formed a new COE called PEGASAS — the Partnership to Enhance General Aviation Safety, Accessibility and Sustainability. The FAA chartered PEGASAS to study some of the operational aspects of mechanical AOA indicators, as well as look at the potential applications of derived AOA (AOA interpolated from an internal system as opposed to a mechanical sensor). These studies, along with several other industry and academia-sponsored projects, proved fruitful in gaining some important operational insight with AOA. With the first AOA-related project, PEGASAS looked at providing background information on AOA for educational and outreach purposes. As a result, the PEGASAS team created a video that provides an excellent overview of what AOA is and why using an AOA display can be beneficial. The video also provides side-by-side demonstrations of three popular AOA displays in operation, pointing out the various visual and aural differences among them. The video is about 20 minutes long, but if you’re in the market for an AOA indicator, or are just curious about how they work, it’s worth having a look: youtu.be/8JcjWnAJGKQ. As part of that same project, the PEGASAS team also completed an operational study to see if using an AOA display influenced pilot behavior during an approach. Three different universities conducted the study and measured the variability of the flight path angle at each second of the last 30 seconds of an approach. The project team also looked at whether AOA training was a factor in conducting an approach, with some participants receiving training and others going in cold turkey, relying solely on intuition. While the final technical report from this study is still pending, initial determinations indicate some promising safety benefits. Complementing these findings was another AOA study (outside of PEGASAS) conducted by the University of North Dakota. This analysis revealed that when aircraft involved in the study turned final, the nose would typically drop about 0.7 degrees more on airplanes equipped with AOA indicators than on those without. This discovery reinforces the idea that AOA systems help pilots maintain awareness of proper attitude control on final approach. Incidentally, UND is also in the midst of a broader and longer-term study on AOA; stay tuned for more information on this in a future issue. After the FAA’s NORSEE policy was issued, the market reacted positively. AOA product availability jumped and more than 600 units were installed in just the first year. “It’s a good piece of avionics,” says Jens Hennig, Vice President of Operations at the General Aviation Manufacturer’s Association. “And what’s nice about this equipment is that it’s possible to retrofit on so many aircraft at a really low price point.” However, Hennig is also quick to caution that AOA “is not the end-state to LOC mitigation.” While acknowledging AOA as an effective and relatively simple way to mitigate risk, Hennig is also keeping his eye on the evolution of future NORSEE products and the potential for more involved technology that can address the core risk of LOC. “We must look beyond supplemental non-required AOA if we wish to truly move the needle on GA safety,” he added. That brings us to PEGASAS’ second AOA-related project, which aims to characterize AOA data inferred by aerodynamic modeling and software algorithms, and develop minimum performance standards for that equipment. Texas A&M University and Ohio State University were the PEGASAS members chosen to help answer those questions and determine whether derived AOA is feasible in an operational environment. The six-phase project spanned a year and a half and involved numerous lab studies and flight tests to try to back out useful AOA data from existing avionics equipment. The plan was to have this data help support three use cases. First is having a gauge in the cockpit that would show pilots their margin from critical angle of attack. The second is using derived AOA to drive an envelope protection system that will work in concert with an AOA sensor and prevent pilots from making improper control inputs during critical situations. The third use case is to take derived AOA as a supplement to sensed AOA in developing fly-by-wire flight control systems. “There are no fly-by-wire GA aircraft currently certified under part 23, but this research is trying to bring in this technology to allow derived AOA to be exploited in flight control systems for vehicles and flying cars of the future,” says Sizoo. With Boeing already predicting the sale of autonomous flying taxis in the next decade, this research may not only have critical implications for enabling future safety standards, but could also be the springboard that keeps this technology on a forward trajectory. So in the end, how useful was the derived AOA gathered during the study? Did it stand up to the AOA fidelity provided with mechanical sensors? Although the team’s technical paper is still under final review, Sizoo remarked that the findings showed great promise of being able to render quality AOA data by hacking into existing avionics. Sizoo further backed up this theory by conducting his own flight test using a Cessna 172 and a Cirrus Vision Jet. “The idea was to look at how well this concept works within the low speed envelope up to high-end jets.” The flight test showed similarly promising results. Who knows? Maybe having R2-D2 or Siri along with you as a digital co-pilot could be a viable offspring of this technology and be another huge step in accident mitigation. But as Sizoo points out, “The key is to aid pilots and reduce their workload, not distract them.” “If we mechanize that interface incorrectly, it can be a nuisance.” You could make a similar argument for existing mechanical AOA displays. Pilots need to pick the make and model that suits them best and works for them, not against them. I think that’s an angle we can all agree on.